For many designers finishing the design of a crossover network is only related to the close match of the simulated SPL response and the target curve, whatever the latter has been set to. Many DIYers or professional engineers believe this match to be only one part of a successful hifi speaker project. Setting the passband level of acoustic branches at 90dB we get the limits of crossover freq.ranges at 70dB SPL. This means that woofer and midrange drivers cooperate (ie. they are both active) in a freq.range of 240-500Hz approx. In a similar way midrange and tweeter drivers define a crossover range at 2200-5500Hz. A complex summation of the two pressure waves takes place at every point of space and at the listener's position. -Does our ear perceive the result of this addition? We don't know exactly. We do know that if the two waves are in phase (or with a small phase difference) the addition gives almost the double (+6dB) pressure level which is normally perceived. What is very interesting is that human brain is not really capable of locating the origin of the sound waves when this sort of addition occurs. On the other hand if the two waves exhibit a very large phase difference the wave addition results in a poor (low) SPL value and the listener's brain perceives the existence of a source perfectly located in space. Where at? Well somewhere between the two drivers that cancel each other. The listener is able to 'pinpoint' the speaker and most often the tweeter driver itself. It is a very spectacular effect and many inexperienced listeners (and potential buyers) get excited by its presence. However soundstage created by such a pair of speakers is erroneous and should be regarded as a design failure. -How can we detect such design problems quickly? Well there is a tool available in simulation software. It is called the Power Response. It is simply a plot of the plain addition of the pressure levels of the acoustic branches. No complex summation is used. This simple addition reflects the total energy released by the drivers at all frequencies (at the measurement axis, at microphone position). Let us work on a 2-way speaker example. In order to make this analysis quicker we ask our simulation software to draw a curve with the plain addition of the SPL responses of the acoustic branches. Phase response of the drivers will not be used for this non-complex addition. The following picture presents this 'power response' as a yellow curve. What is interesting is that the (green) overall SPL response is a very good one indicating a speaker system that could otherwise be regarded as a quality design. Even the speaker's impedance is very good. 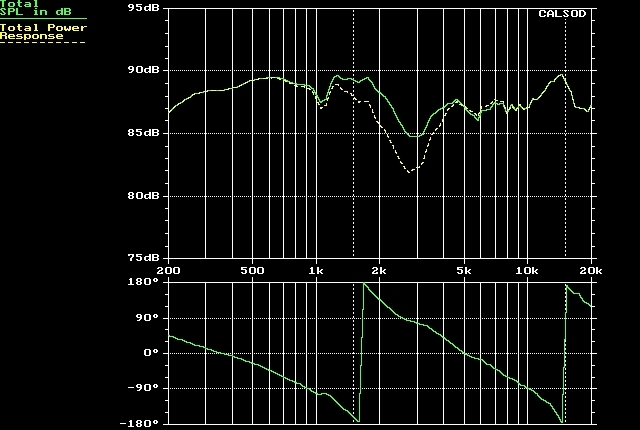 However the dotted (blue) power response curve is above the SPL response at a very wide freq.range. This indicates that throughout all this range drivers are fighting each other emitting sound waves having a severe phase difference. 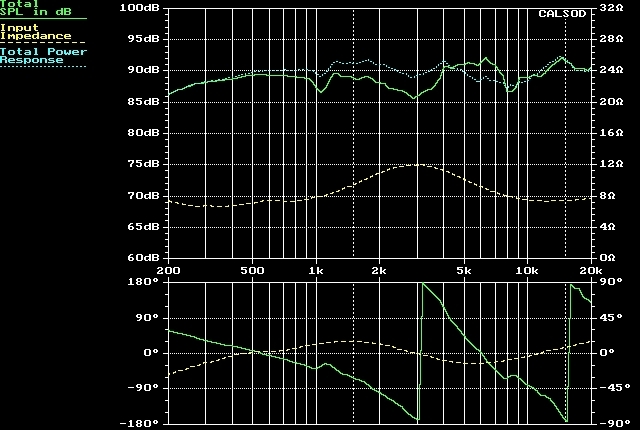 Up to 4000Hz drivers do not cooperate as they should. Crossover network is a failure; the listener will be able to pinpoint the speakers. Sound imaging will be poor and fictitious. -So what should we take care of ? Crossover design does not end at an SPL response close to a target defined by us. 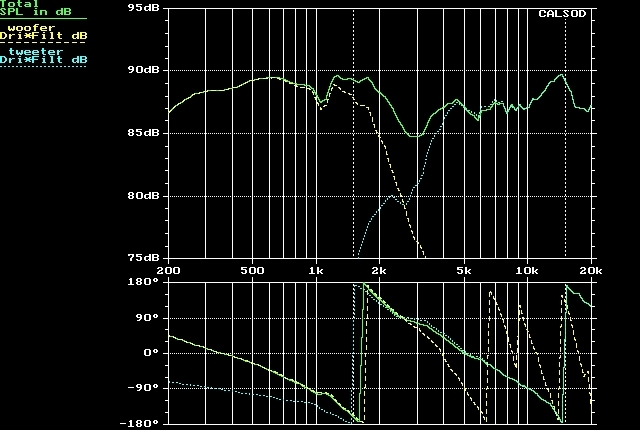 We must also check for the power response to be lower than the SPL one throughout the crossover freq.range. The presence of a maximum 3dB difference will indicate a very good driver cooperation and complex wave summation. Experience in crossover design will prove this new design aspect to be very fragile when crossover freq.ranges are very wide (wider than one octave). This is the reason that made many engineers fond of high order crossover filters that lead to relatively narrow crossover freq.ranges. -In an early tutorial article concerning driver SPL response we mentioned cone break-up resonances. What is their role in crossover design ? It is true that a speaker having a flat (or whatever shape we wish it to have) SPL response within its passband, may not sound as expected. A saxophone playing with roughness (or harshness) at mid frequencies or a performer's 'sh' sounding irritating at increased power levels, are all signs of hidden resonances that degrade sound clarity. We won't be able to detect them in the overall SPL response of our speaker system. That is why we said they are hidden. Driver cones or diaphragms are supposed to be moving as a rigid body and thus producing consistent waves. Instead their rigidity is lost at higher frequencies. Their cone or dome shape breaks up. They are divided into rings oscillating inconsistently. There are frequencies coming out of the driver magnet-coil assembly that make parts of the cone or dome resonate and emit very 'loud' waves. Even when the electric stimulus stops, the cone still emits these resonace frequencies. That is why they compromise sound clarity. The above figure is part of woofer published datasheet, illustrating the SPL response at various positions 1m away from the driver. Black curve is measured at drivers axis straight ahead (0 degrees), green curve has been acquired at an angle of 30 degrees and the red one at an angle of 60 degrees. As the angle increases woofers become directive sound sources that decrease the SPL they emit. Theory predicts the presence of a smooth roll-off at higher measurement angles. If this rolloff is interrupted by a persistent peak then the latter is due to a diaphragm resonance. In this case we have a strong resonance at 4600-4700Hz and a mild one at 3000-3200Hz. Strong resonances should be attenuated by crossover filters with at least 20dB of negative electric filter gain. This is an additional design target that may impose limits to the associated filter cutoff frequency and/or order. Woofers need special attention with respect to cone break-up effects.